How will they decorate the nursery? While we don't know for sure, online interior design company Modsy has some ideas. If the room decor was entirely up to the duchess, it might be a neutral-hued minimalist space, predicts the Modsy team. "We wanted to pay homage to Meghan's California upbringing and think her design style would emulate a casual and easy aesthetic that feels put together yet effortless," said Alessandra Wood, Modsy's vice president of style. Want to steal this look for your own space? "Find pieces that you love and create layers of comfort through neutral textures and patterns, introducing contrast," Wood said. "Bring in a printed side chair or rug for a bolder accent." 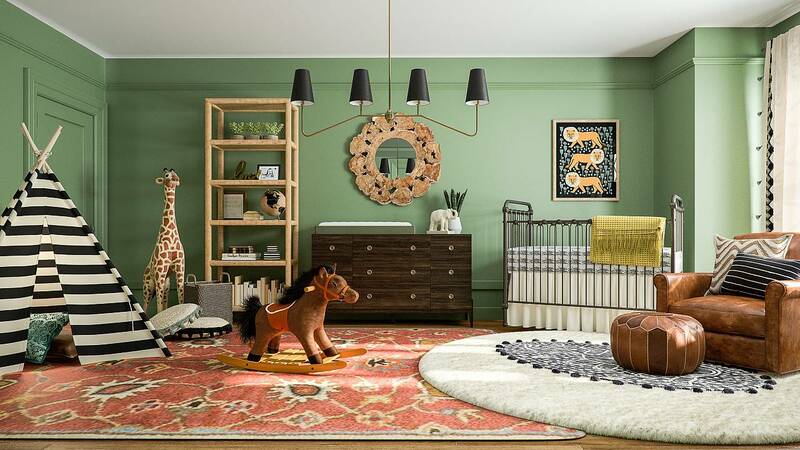 Who says moms get to have all the fun designing a nursery? Harry might want to add his own touches to the room, and if he does, it could take inspiration from more masculine, British design and nods to his polo days, Wood said. "His love for travel is reflected in the design as well. He'd definitely want to create a space where the baby is inspired to travel and explore." 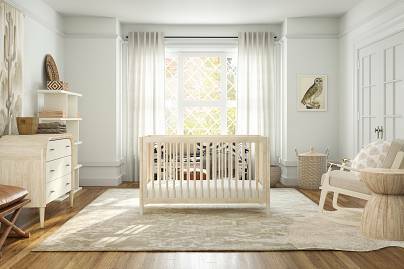 If the baby's great-grandmother, Queen Elizabeth II, had a say in the design, it would be a fresh take on the classic English cottage style, Wood predicted. "Queen Elizabeth's design takes inspiration from the English countryside. 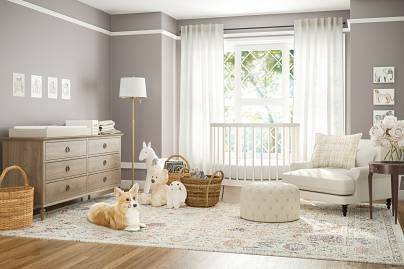 The cottage style in the nursery is sweet and inviting with elegant details." The round crib feels rather enchanting, and a cute corgi — the Queen's favorite dog — sits in the corner to protect the baby. For a look like this, "mix rustic woods together to create a collected feel and sprinkle in a few eclectic touches, such as an antique painting," Wood said. 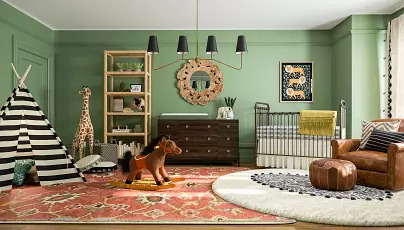 If the baby's aunt, Catherine, Duchess of Cambridge, were to take over the design, the room would probably reflect her contemporary and cool fashion sense. "Kate is incredibly fond of interior decorating and would have gone the extra mile in designing a nursery space for Meghan," Wood said. Like this style? "Look for coastal-inspired textures and materials, such as wicker or rattan," Wood suggested. 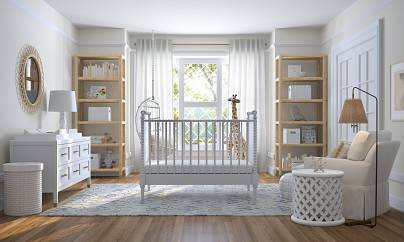 "Mix in classic pieces in your base furniture (dressers, cribs, tables and bookcases) and find a color scheme that works with your chosen coastal materials."